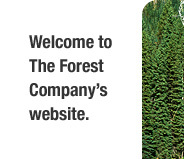 We are an alliance of solutions-oriented businesses within the BC coastal forest industry. When striving for success in any or all facets of your business, be assured that our individual and combined achievements will spearhead your opportunities towards increased profit margins and net profits. In the fast-paced, complex environment of today, reliability, dependability, and innovation are essential. Our association fills that need. Our alliance provides expertise in many areas including forestry, log and lumber marketing, geographic information systems, heli-logging, transportation, silviculture, financial, safety, insurance, marketing, and sport fishing to name a few. Please view our Directory for a complete list of our results-driven associates. The Forest Company is an alliance of proven and driven business professionals, dedicated to finding better financial margins for our customers. Our definition of success is providing our customer with these improvements while concurrently maintaining the highest standards and levels of integrity.